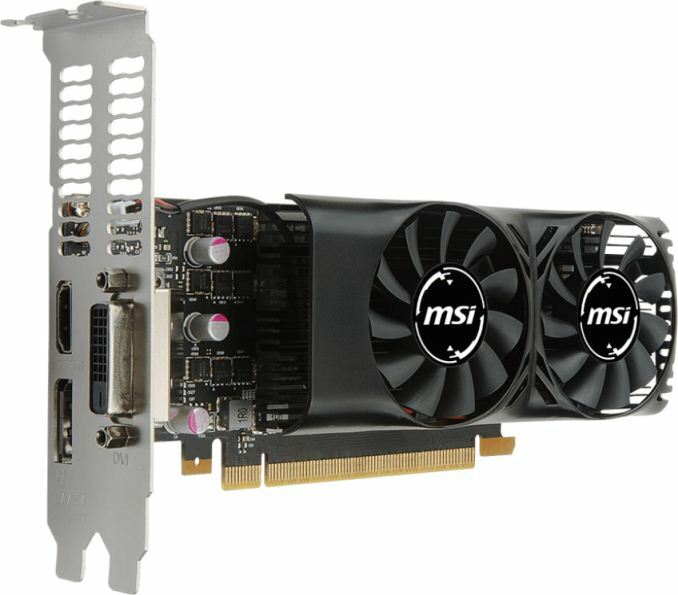 MSI has quietly added a new low-profile graphics card into their lineup. The adapter is based on NVIDIA’s GeForce GTX 1050 Ti GPU featuring the latest Pascal architecture and carries 4 GB of GDDR5 memory. The card will replace those powered by NVIDIA’s first-generation Maxwell graphics processors in MSI's lineup and will be among the most affordable gaming-grade graphics boards on the market. The card does not require auxiliary power and is compatible with a wide range of PCs. The drive is still dual slot width, however. The MSI GeForce GTX 1050 Ti 4GT LP is based on the GP107 GPU (768 stream processors, 48 texture units, 32 raster operations pipelines, 128-bit memory bus) clocked at 1.29/1.39 GHz (base/boost) and carries 4 GB of GDDR5 memory at 7 Gbps. The board has DL-DVI, HDMI 2.0 and DisplayPort 1.4 outputs with HDCP 2.2 support, which is required for Ultra HD Blu-ray playback. Tthe card comes with a dual-slot cooling system featuring two fans. The low-profile GeForce GTX 1050 Ti consumes up to 75 W of power, and as a result it does not require any auxiliary power connectors - something important when upgrading low-end PCs from large OEM brands that sometimes do not have any spare connectors left. The lack of power connectors will allow the video card to replace the GeForce GTX 750-series and the GeForce GTX 950 75W series adapters with similar power consumption. Nowadays it is not easy to find a low-profile graphics card with reasonable performance and a good feature-set. NVIDIA’s GP107 GPU is based on the company’s latest Pascal architecture and thus supports DirectX 12 and Vulkan APIs as well as has an advanced media playback engine that supports hardware-accelerated decoding and encoding of H.265 (HEVC) video. 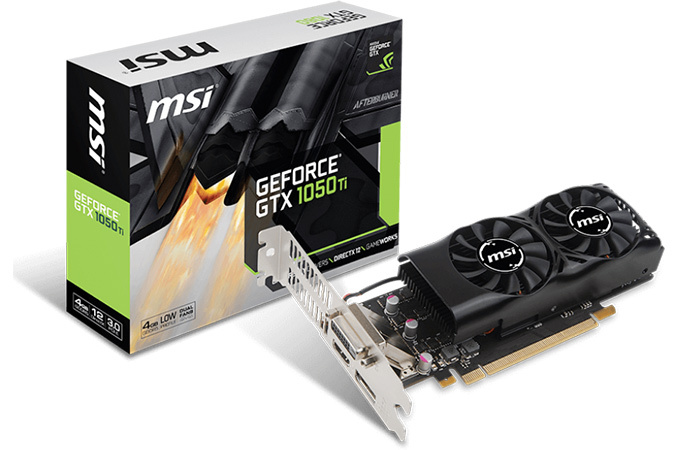 Therefore, MSI’s GeForce GTX 1050 Ti 4GT LP graphics card is an interesting product compatible with slim and outdated desktops and HTPCs. As an added bonus, MSI claims that it uses MIL-STD-810G certified components to ensure a long lifespan for the board. MSI did not announce the price of the GeForce GTX 1050 Ti 4GT LP, but it is unlikely that it is going to cost significantly higher than $139 recommended by NVIDIA.